Yep, that about sums up the last day and a half. Not the boring kind of yawn, but the exhausted kind! We got home Tuesday afternoon, and a bunch of our family was there to welcome us! Lots of balloons and signs and just a general fun party at the Phillips’ house. Scott and I have decided that Annabelle is doing better at home than WE are. Tuesday night – first night giving meds, Momma messed up! Gave one that is supposed to be a 10AM med at 10PM. Plus, it is supposed to be mixed with feeds, and I gave it directly into her Gtube. I think was just SO SO SO nervous about screwing something up when drawing up the meds, that I, well, screwed up. 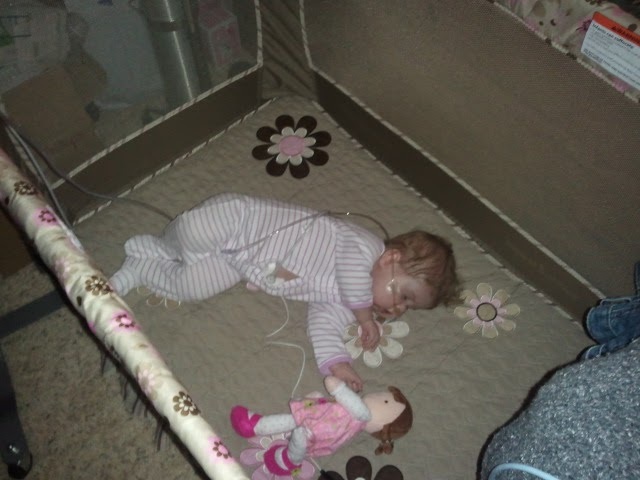 Wednesday morning – Scott was putting her in her crib for her morning nap, and her feeding tube caught when he laid her down, and POP! Out it went, inflated balloon and all! We both panicked at the site of a big gaping hole in our daughter’s stomach with milk gushing out! We’d practiced this once about a month ago, so we sprang into action, and even though we had a few missteps, we got it back in, and so far, it looks fine and isn’t leaking. Then, when she was safely asleep and doing well, I ran to Target to find something to help us organize her meds before I pulled my hair completely out of my scalp. I found what I needed, and a few other items so I didn’t have to make a trip again for a while, and was headed up to the check-out lane when I fished through my purse and found… NO WALLET. Yep, I’d taken it out at home the night before to look for something, and never put it back in my purse. So no money. BLAH. My mother-in-law came and brought me money, but still, embarressing, time consuming, and just plain irritating! Then I got home to find my husband breathing a little harder than necessary. He’d given her her 2:00 meds (which I was supposed to be back in time for, but wasn’t because of the wallet debacle) and when he gave her MOST IMPORTANT MED SHE HAS, he hadn’t unclamped the Gtube, so ALL of the meds came out the “feed” port and onto the floor. Yep, she got none of it! He redrew and regave it, but we were both a little frazzled and nervous. Then last night, we had storms, and the power went out. Granted, only for a few minutes, but we hadn’t thought ahead, so were rushing around to find the stuff to get her hooked up to the emergency oxygen (she has a concentrator that gets plugged in, so obviously it stops working when the power does!) We got it hooked up JUST in time for the power to come back on, go figure! Despite all of our “fun”, we wouldn’t trade home for the world! Having all my girls here, being able to be a mom, is worth every minute of sleep lost and every tear shed and every hair in my head that will likely turn gray soon! Here is a few pictures. *yawn* I have a lot more, these are just the ones from my phone, but I’m trying to hurry get ready to go to our first clinic visit today! Please be praying it goes well, that her numbers look well, even with our screw-ups!!! Will post more/better pics when I have a few minutes! Me, my dolly, and my oxygen… with NO leads… getting ready to go HOME! On my way home! This car thingy is kinda weird… but I give it an index finger AND a thumbs up! My ride… Daddy decorated it JUST for me! My first night-night-home… My mommy made me sleep in the port-a-crib in her room instead of my own bed… but whatever, I was home, and that’s what mattered! SOOO glad your girl is home. Annabelle WILL do better than Mom and Dad, but that's OK. I've lost track of how many times Rachel's G-tube has popped out. Messy, but quickly fixbable. If it comes out because the balloon pops, just tape it in till they can get you a new one. This is all VERY normal, mishaps and all. It sounds like y'all are doing GREAT! Such a wonderful blessing!!!! I'm so glad you are home. I'm sure you will get the hang of the meds very very soon. You are a good mama! Wonderful news! 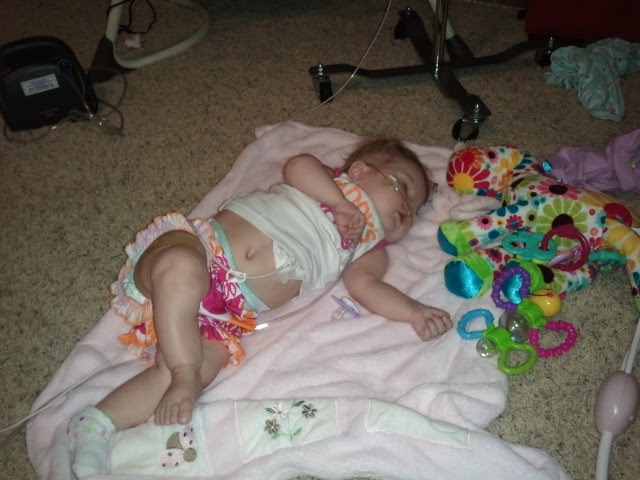 So happy your little blessing, Annabelle, was able to come home! Will continue to pray for this new transition and for lots of time for you and your hubby to catch up on some much needed sleep. Praise the Lord for His great love and mercy through all of this! God bless! Oh no! 🙁 You have so much going on and are sooo tired….stay safe and get some sleep, somehow. But woot! She looks so happy at home! I'm so happy for you guys! Praying for your clinic trip and trusting all is wonderful! Be Blessed! 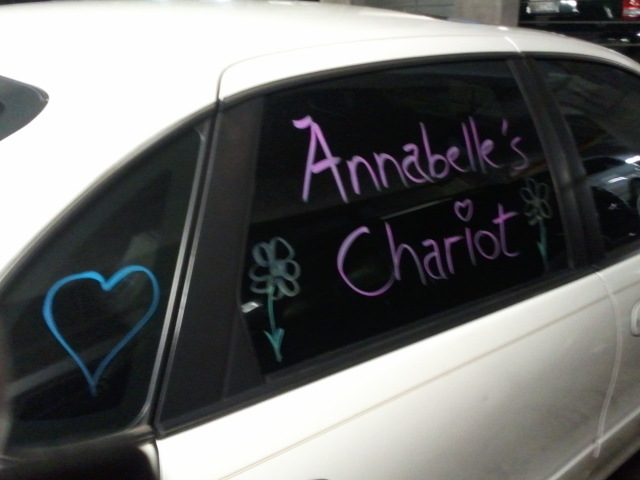 Hooray,Annabelle is home! I'm so glad everybody made it home ans I'll be praying for a good visit at the clinic. Reading all the mishaps made me smile … I remember those days, though Daniel's feeding tube didn't come out that soon. 😉 I'm know it isn't the first time there have been mistakes but your nerves will calm down and you'll find yourself in a routine sooner than you think. I wish I lived closer and I'm come watch Annabelle for you while you had some time to sleep, play with your other girls or whatever. Then again, if you're like me, it might be sometime before you feel comfortable leaving her with anyone that isn't family. We continue to pray for you all. May God continue to bless. Hooray for home! 🙂 Love the pics, thanks for sharing. Will keep you all in my prayers. I figured things would be pretty hectic when you got home, but I'm sure it will settle down as soon as you guys adjust to the new routine. I've been praying for a smooth transition (so things weren't too smooth, but hey! Annabelle is still alive! And so are you!) and will continue to do so. LOVE the pictures! For some reason, Annabelle looks so much bigger at home! She's so cute! I'm so glad you're home with ALL your girls. Things will be challenging for a while, but I trust you'll get the hang of it. I love the way you and Scott work as a team. What a blessing for Annabelle to have such loving parents. 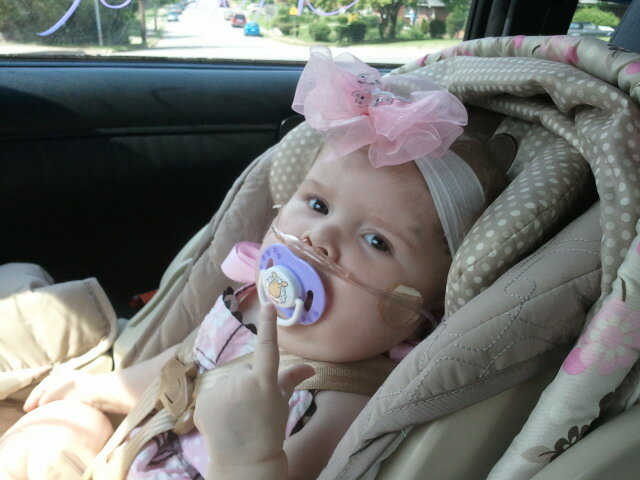 Tears of joy seeing Annabelle in her carseat! My girls were so excited!!!! We continue to pray for each of you throughout each day. Praying that you are able to rest and God gives you a "peace that transcends all understanding". 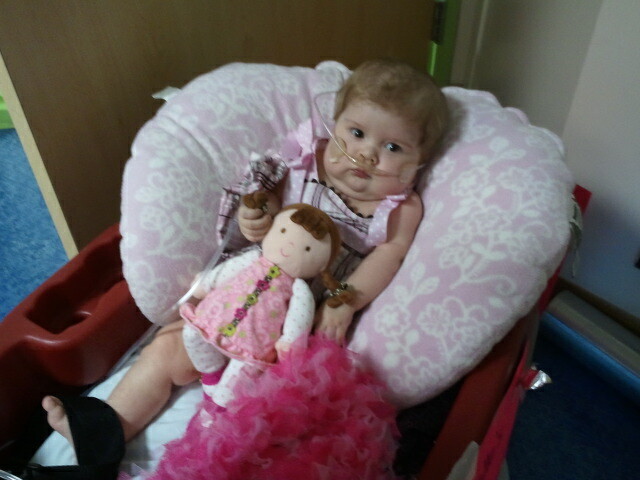 We are praying that Annabelle continues to grow strong and healthy. Oh, Krista God's doing an amazing work in your family! Hon, you're doing just fine. A little "mishaps" is allowed. 🙂 I'm truly glad you're home, and I'll pray that you'll be allowed to stay there. First, do you have Oxcimeter on her toe or her foot? We were able to put it around Simon's foot (the outer side) and it does not trip as often. He is also an HLHS patient, just didn't have the transplant. I DO NOT sleep well if he is not on monitor, even now that he is not on oxygen and hasn't been for a month or so. Second, we have screwed up his meds several times in the 6 months he has stayed at home and he is still here. You will get the hang of meds and the longer she is home and she is improving, the less meds she will need and the easier it will be. Third, Simon is 13 months old and has NEVER slept in his room. 🙂 I'm way too nervous to put him in a room without an adult while we are sleeping. So don't feel bad! We have never met but I have followed your blog for so long, I have come to know that you and your husband are wonderful parents to your sweet girls and you guys will do wonderful in taking care of Miss Annabelle 🙂 We are still praying fo you!!! I have anxiously been waiting to see if you got home!!!! I tried to post the other night, but somehow it got erased and I was sooooo tired I went to bed instead of rewriting. I was chuckling that night at your post of all you wanted to get done when you get home….and then your reality check. And I thought to myself her reality check sounds a lot like……….what her reality is going to be!!! But is it not so good to be HOME!!!!!??????!!!!! I was amazed at how quickly the frustrations of the long months of waiting faded into the background. Makes me realize just why when we get to heaven we will be praising and worshiping and not remembering all the hard things of here……. I too have messed up meds, not yet since we have been home this time, but before. It is scary, but it does happen. AND….it happens in the hospital, as we found out today when in for a cath and biopsy…they accidently double dosed our girl with one med….and now her labs tomorrow will be off so we will need to stay till Saturday! Anyway……your first days at home sound overwhelming, and normal. I so hope you get sleep!!! Don't worry about your girl being in your room….we still haven't moved our girl to her room either. You do what you need to do to be comfortable and be able to rest easy. She will eventually get into her own room. I am just so happy for you all!!! As I sit here typing this, I am also hoping and praying for a family here at "our" hospital, whose little 7 yr old has been in the CICU for the last 8 months with a Berlin heart….they found out a couple of hours ago that they may have a heart for her!!!!! I didn't want to be back here spending more time so soon( this is our 2nd overnight trip back since we got home 2wks ago) but I am so excited to know that I am here and able to pray specifically for this family and that this heart will be a perfect fit for their girl!! Makes being here a good thing to me, and not the dreaded thing I had made it out to be! Do you not find yourself amazed at how much more you know, and how much more you FEEL with other families??? Well, she is just soooo beautiful. I am so happy your Annabelle is home and I will pray that things settle down some and you and your hubby get that much needed rest. THANKS everyone!!! Your thoughts and well-wishes mean SO SO much to us! We are so incredibly excited to have Annabelle home!! Ramona… yes, it is messy, HA! We have a spare one on hand just in case! Elizabeth… we keep it wherever we can get it to pick up! Usually it's on her foot… her toes are hard to keep it on! Toni… I totally know the feeling!!! And will be praying a TON for the little girl getting her heart! Praise Jesus!! And praying you all are able to come home again soon!! !